If you’ve been looking for the perfect way to feed your mind and your belly at the same time, why not participate in this year’s Edible Book Festival? The International Edible Book Festival is a world-wide event, begun in 2000, that allows participants to celebrate both their literary and culinary culture—to ‘eat their words’ and let others eat them, too. The Urbana-Champaign community has been taking part in the festivities since 2006, and this year’s local festival is just around the corner. If it sounds like your cup of tea, register your entry now and get ready to celebrate! What: Bascially, take a book, and make an edible version of it—it can be a direct visual representation, or a clever play on words, or something in between. A panel of judges will award prizes in different categories, and then everyone gets to chow down! Why: Because food and books are fun things to share! All the information you could ever need about this year’s festival can be found at the official festival webpage, so head on over there if you have questions, need more information, or just want to browse the galleries of previous years for inspiration! If you want to check out the literary origins of your favorite entry, we’ve assembled a Pinterest board for just that purpose. You can also visit the festival’s Facebook page to find out more, or just share your enthusiasm. We hope to see you there! In case you’ve missed the brightly colored Pug posters, the “Stall Stories” or our tweets and Facebook posts, therapy dogs are coming to the UGL next week—for real! 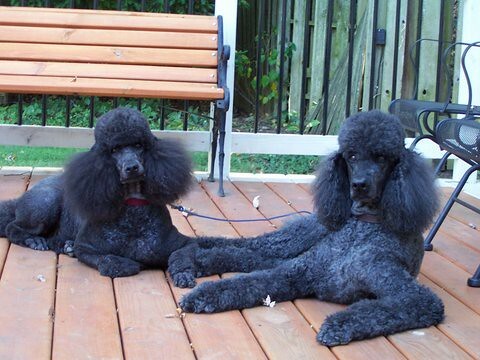 Raven is a 6-and-a-half-year-old Standard Poodle. She loves people of all ages, but prefers adults since they are the best petters. She does most of her therapy work at libraries (so she’ll fit right in at the UGL!) and at the Urbana Crisis Nursery. When she’s not working, she enjoys fetching frisbees and tennis balls. Hunny is a 6-year-old Australian Cattle Dog mix adopted from Good Shepherd Humane Society near Eureka Springs, Arkansas. 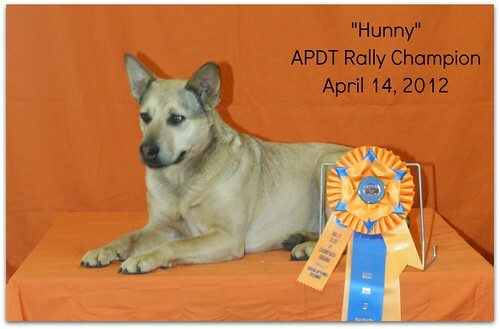 In addition to therapy visits, Hunny trains and competes in Dock Dog and APDT Rally Obedience venues earning a Junior Dock Dog and APDT Rally Championship titles. 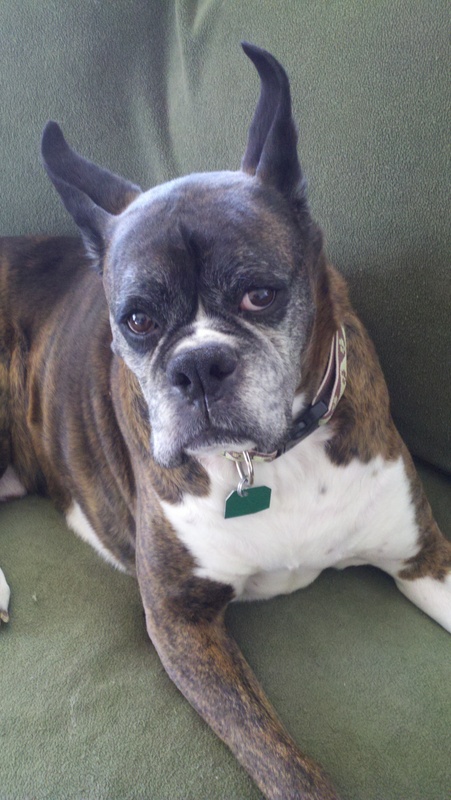 Hunny is also a canine star of the theater, most recently appearing in S.T.A.G.E. 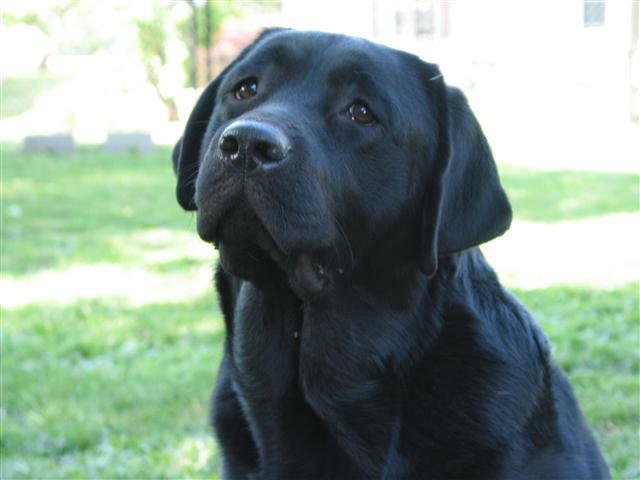 productions of “The Miracle Worker” and “Cranford.” Hunny shares her People and Paw Print Pond with five Chesapeake Bay Retrievers, two Labrador Retrievers, and five rescue cats. 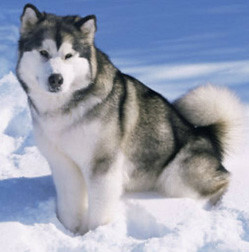 Full disclosure: This isn’t Sam, but we’re sure he’s just as handsome as this Alaskan Malamute. Sam is a 7-year-old Alaskan Malamute. He’s a very calm, large, furry, wolfy-looking dog who is quite content being petted. He has a Three Stooges sort of sense of humor, is very curious, and very typical of the Malamute attitude that anything that happens, he can take care of, so why worry. He also subscribes to the belief that you can never know when you might have to pull a sled, so nap whenever possible. Energetic isn’t an adjective one would use to describe this guy. He is casually obedient, selectively deaf, but utterly charming and sweet. He’s a conformation champion (so he’s quite stunning), loves agility obstacles though he hates to jump, and he isn’t too crazy about do-overs. He suffers from severe test anxiety, so understands what mid-terms can do. If these dogs look like good cuddle BFFs to you, stop by the UGL on Monday or Tuesday to say hello. 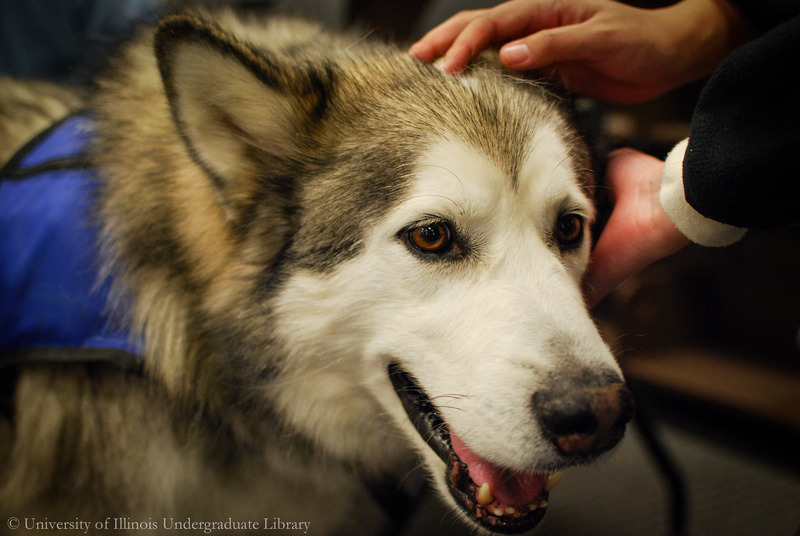 Interested in learning more about therapy dogs? 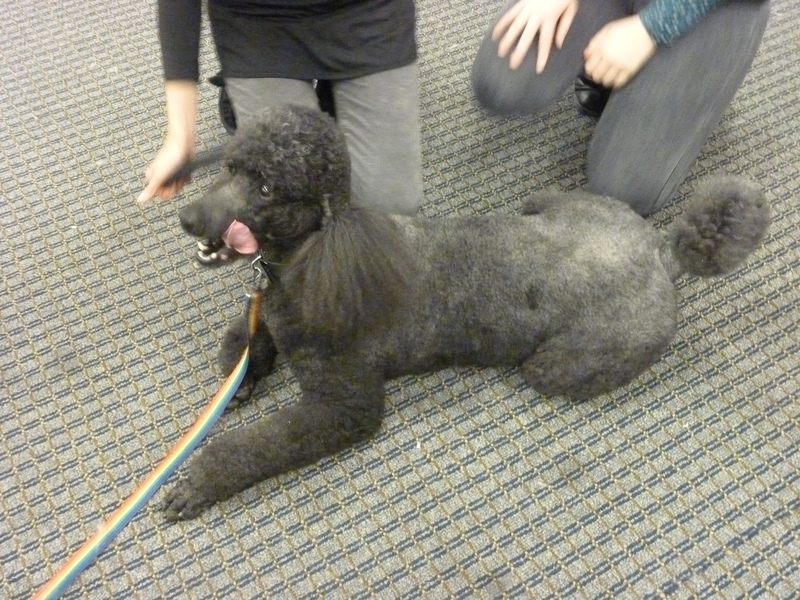 Check out Pet Partners (formerly the Delta Society) to learn more about the work that therapy dogs do. October is halfway over (uh, what? ), midterms are almost here (say it ain’t so! ), and the semester will be wrapping up before we know it (gulp!). 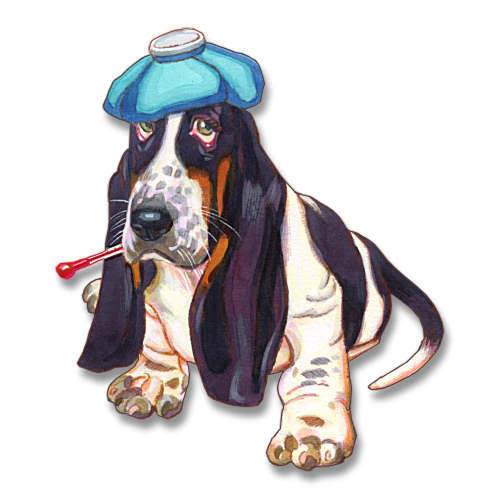 The last thing you need to worry about on top of everything else you have to get done is being sick. Fortunately, as students, you can get a flu shot from McKinley Health Center (if you want) for FREE! That’s right: free of charge, gratis, zip, zero dollars, cheaper than dirt, etc. And, you don’t even have to make a separate trip to McKinley if you’re already spending all of your precious free time in the UGL studying. This week, on Wednesday, Oct. 17 and Thursday, Oct. 18 from 1:30pm to 4:30pm, you can get your flu shot right in the UGL. McKinley will have a tent set up on the upper level, near the collaboration rooms. There are several differing opinions on the importance of getting a yearly flu shot, though when living and working in highly communal areas like a university campus, the benefits may outweigh the risks. The Center for Disease Control has a detailed FAQ about the seasonal flu shot if you’re looking for more information. If you choose to get a vaccination, all you need to do is bring your I-Card to the UGL on Wednesday or Thursday. McKinley staff will be on hand to administer the vaccines. If you can’t make it to McKinely but also think you will miss the dates in the UGL, take a peek at the whole list of McKinley’s flu shot clinics, happening around campus (they’ll also be back in the UGL on Oct. 29). Flu shot or not, we wish everyone a healthy second half of the semester—after all, whose research and circulation questions are we going to answer if everyone is home sick? Learn to create iPhone / iPad apps! Ever had a great idea for an iPhone app and the only thing keeping you from making it was your lack of app-making knowledge? Well, now you can turn your app dreams into “re-app-lities” (OK, that doesn’t really make sense… but you get what we’re saying, right? You can learn to make iPhone apps!). Come to the UGL (Room 289) next Friday, April 27th from 6:30-8:00PM for an app-making workshop specifically designed for beginners. No programming experience required! In fact, we encourage those with little or no experience to attend! Learn to make iPhone apps! The Undergrad Library is pleased to announce a free workshop for developing iPhone and iPad applications. While these workshops are primarily aimed at undergraduate students, all interested campus affiliates are welcome to participate. Advanced registration is requested due to limited seating. All materials will be provided. We will be using templates from Apple’s Dashcode development environment, which takes a web-based approach for application design. 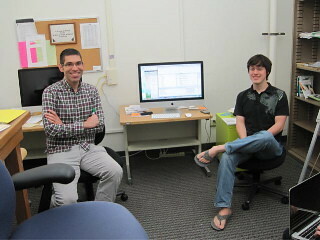 Summer Diversity Internship at the UGL! Get real software developing experience with this cool team! Are you a University of Illinois undergraduate student with a 2-year IT degree or a minor in Informatics? Are you interested in getting real experience developing software in a collaborative, team-based research environment? Are you awesome? YES?!? Then you might be the perfect candidate for the UGL’s new 8-week summer internship opportunity for students from diverse backgrounds. Read all about it below! Non-traditional information technology career exploration for undergraduate students with two year IT degrees from diverse backgrounds; the University Library is recruiting diverse candidates for a summer paid internship in software development. 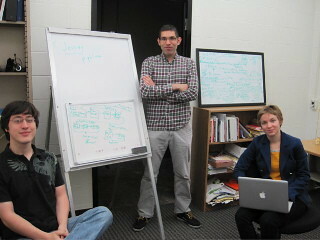 Students will co-design library software services in a collaborative team-based research and development group based in the Undergraduate Library. Participate in a collaborative software development team for library services that aid information discovery. Must be a University of Illinois undergraduate student from a diverse background with two-year IT degree; or, enrolled in the Informatics Minor. Programming experience with object oriented languages (preferably Java), familiarity with RESTful web services for API development. To apply: Send cover letter and resume to Jim Hahn, jimhahn@illinois.edu , Orientation Services and Environments Librarian. Check out those sweet iMacs!